A mini-kachcheri racket where flats from state constructed housing projects were offered for sale on Housing Ministry documents carrying the forged signature of Minister Sajith Premadasa has been busted by the Colombo Fraud Bureau (CFB). At least 68 complaints have been made to the Bureau by families who fell for this racket because they wished to have better living standards than the slums. Some of them made advance payments of between Rs. 110,000 and 160,000 each to reserve a flat. CFB Chief P.P.A. 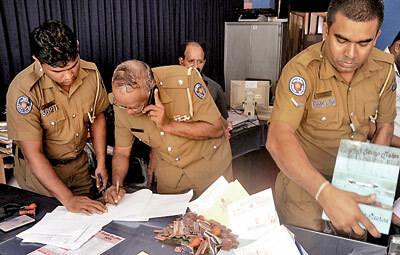 Wijenayake said they had probed some 28 complaints and arrested three suspects while a search is on for a former Urban Development Authority (UDA) officer who allegedly stole the letterheads from the ministry. According to police, a broker had approached prospective buyers, telling them that flats were available in housing schemes in places such as Modara, Bloemendhal and Thotalanga and they could get one from a person ‘close to the minister’. After the deal was discussed, a person posing as an officer involved in the project had turned up. He was accompanied by a ‘bodyguard’ carrying a walkie-talkie and dressed in an outfit similar to one worn by bodyguards of a Parliamentarian. The man who posed as an ‘officer’ explained to the prospective buyers that due to the elections some of the flats had not been given and a few were available for Rs one million each and this could be paid in instalments. He had also shown some of the vacant flats to the buyers. The man had collected advances saying that a ceremony would be held soon to hand over the flats. However, nearly five months later since the prospective buyers had not received the flats they had made inquiries from the UDA. Chief Inspector Wijenayake said the victims had complained after the UDA informed them that the documents given to them were forged. 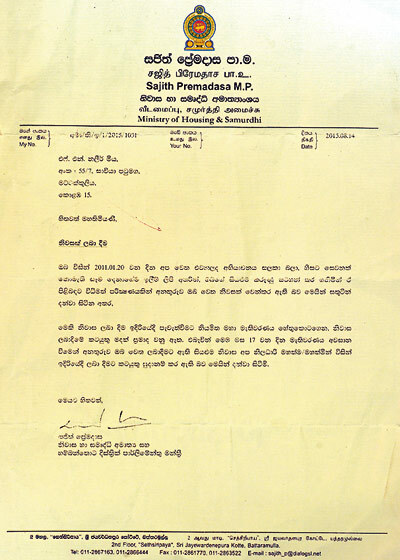 The signature of Minister Premadasa and another UDA officer used in the letters had been scanned and reprinted on the letters. Following the complaints, the CFB arrested the main suspect, Sampath Narangoda from Borella along with an accomplice, Kirigodage Thushar, from a house where they were running a ‘mini-kachcheri’. The police said they found several forged documents of various ministries and more than 70 rubber stamps of various officials. The main suspect had bought a car, five trishaws, a 600 cc motorcycle and operated several other businesses mostly with the money he obtained fraudulently from poor people. The suspects have been arrested and remanded. The Chief Inspector said the CFB was receiving more complaints and called on the people to provide more information about the suspects. He advised the people not to get fooled by such racketeers and to double check matters before paying so much money.